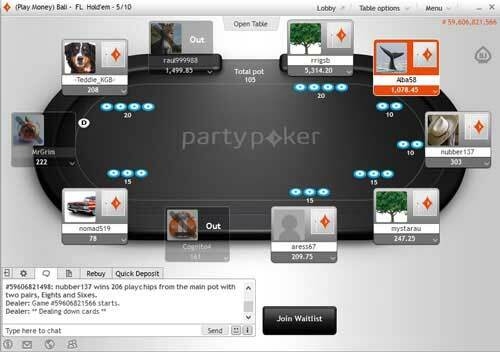 Party Poker is one of the most prominent and trusted websites out there. The Party Poker Download size is 18 MB, and doesn’t take very long to download (only about 30 seconds on DSL). You will initially download a small file that will then run and fetch the rest of the required files. Click either “save” and then “run” or just “run” to initiate the installation wizard. The wizard is very simple and it takes less than a minute to install and get going. 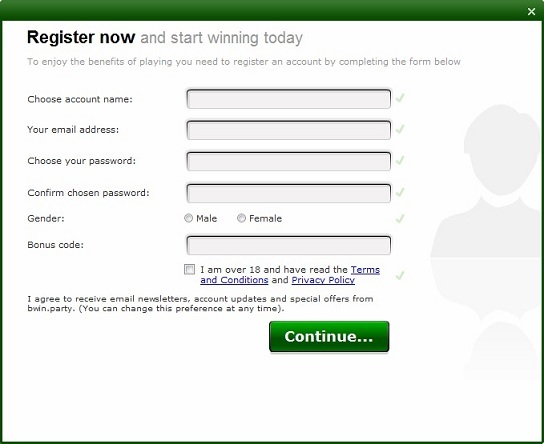 Once it is installed, the only step left before you play is creating your account. The website offers a plethora of different languages for all sorts of tasks. The software, website, and support can be run in 13 different languages, making it easy for anyone, anywhere to download, log on and play. Unfortunately, if you live in the US you won’t be able to download and play on Party Poker. To play, you must have Windows XP or higher. In addition, Party Poker now accepts players using Mac computers with their Party Poker Instant Play. Play from anywhere using a Windows XP+ or Mac operating system. Party Poker Instant Play works with the following browsers: Internet Explorer 7+, Firefox 3.5+, Chrome 6+, Safari 4+, and Opera 9+. Party Poker has been around for a while, so you can be assured your money is safe there. They are licensed and regulated by the Government of Gibraltar. Their games are tested by iTech Labs, an independent tester of gaming and wagering devices to ensure that games are fair and operate correctly. 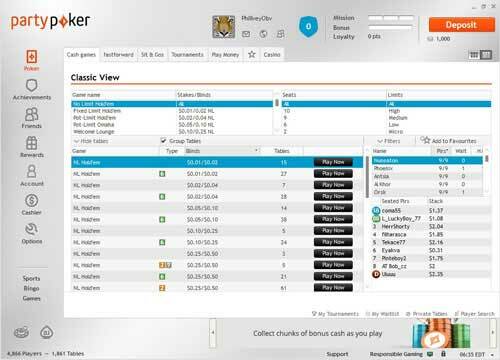 The Party Poker Software is easy to download and use, running on a very secure server. With over 100,000 tournaments a week and millions of dollars in payouts each day, the Party Poker Download is a great place to play! 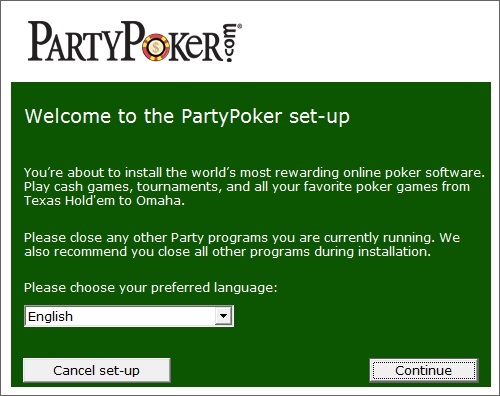 Party Poker has recently updated its software, discarding the old version they had been using for years. The client is now a lot more attractive and uses a unique menu and tab system to filter between games and styles. You can also switch back to the traditional file tree system at the click of a button. With this older method you choose the type of game you want and can collapse or open the different types of that game. Either version can be set as the default, so you can stick with whatever you prefer. There are numerous other improvements, including personalized avatars, multi-tabling alerts, and enhanced table graphics to name but a few. This new client has a variety of excellent features including: customizable pre-flop and post-flop betting tabs for NL games, customizable bet slider behavior, option to use your mouse wheel to set the bet size, Auto-Buy in and Auto-top off for cash tables, options for changing how tables focus when action is pending. Tournament specific features include: Synchronized breaks, Late Registration, Tournament Dollars, Auto-Buy in for Sit & Go tables and registering for upcoming events right from the website without needing to load the client. Newly added features include: Single-Click Session options to make multi-tabling a breeze, Anonymous Heads-Up tables, highlighting the names of pro players, the option to fold and show your cards. Another excellent change is being able to view all MTT/STT lobby information right at the table. The following information is available in the chat area using the tournament info tab: total chips in play, largest/smallest/average stack, your position, time to next break and time bank balance. Party Poker gives great incentives for you to download their software. They offer great promotions year-round, including satellites to live events like the World Poker Tour and Grand Series of Poker. Of course they have a bad beat jackpot and offer $22 free for new players, amongst weekly guaranteed tournaments and other promotions.